Planning a Sweet Sixteen birthday party for your teenagers can be a lot to deal with, and if your teenager is like most, she can be a handful sometimes. Between them trying to be cool and needing their space, interacting with your teen can be exhausting sometimes. Throw that sweet 16 party in the mix, and it's easy to feel like you've bitten off more than you can chew. There are the questions of who to invite, how many people to include, and just how to get everyone together. But most of all, there's the theme, activities, and locations to figure out. 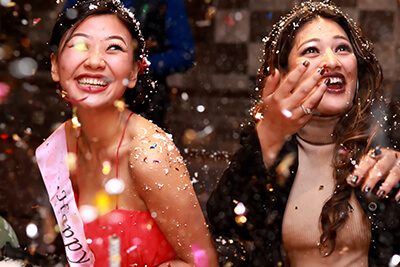 With all of the different themes and activities you can do for your daughter's sweet sixteen bash, it's easy to feel burdened with the mass of options. Whether your teen wants to have an at-home sweet 16 party, or if she'd rather go out on the town for different events, you can always rent a party bus to help with your transportation needs. A party bus take a big load off the parents for transporting the girls to the party or to the various locations your daughter might want to attend, and you won't have to worry about your newly driving daughters getting lost on the road. And with a party bus, the girls never have to stop celebrating just to change venues, and you'll have a trained and licensed driver to ensure that the girls always make it where they need to go safely. Here are some ideas your teen might be interested in for her sweet sixteen! If your daughter is the kind of girl who loves retro stuff and classic fun, why not throw a classic sock-hop style party, and end it with a real drive-in movie? With real costume parties becoming a thing of the past, what better way to celebrate your daughter's future than with a classic costume bash? You could have the bus pick up all the girls around town, pick up some milkshakes and burgers from a local diner, and bring them home for a dance party. Then, once night falls, you can have the bus drive all the girls down to the drive-in theatre. We recommend the Ford-Wyoming Drive-In Theatre, which is the world's largest drive in theatre and is always a classic destination any night of the week. Just bring some blankets and some snacks, and choose your screen! These theatres are rare, and this kind of party not only exposes your daughter to some great cultural history, but she'll also be proud to have a very unique and unforgettable sweet 16! And with our driver behind the wheel, you don't have to worry about the safety of the girls driving home after dark. If your daughter's birthday falls in the winter months, and she’s the kind of girl who enjoys outdoor activities, why not try ice skating for her sweet sixteen? Ice skating is an activity that is enjoyed by teens because it's fun, and it involves mingling with other people. What teen girl doesn't love people watching and checking out the boys with her friends? You can have the limo bus drive the girls to the skating park, where they'll be nice and warm in the bus safely escorted and enjoying the ride. Try out the Campus Martius Park in the heart of Detroit, where there are always plenty of people having a great time. The park also rents out ice skates for the day, so you won't have to worry about any of the girls being left out because they don't have a pair of their own ice skates. During the summer months, what better way to throw a sweet 16 than to take the girls out to a water park? It's a good way to beat the heat, and a great way for the girls to let loose and just have fun in the sun. You can always try the Red Oaks Water Park in Madison Heights. Have the party bus come and pick the girls up and transport them to the park, where they can swim in the pools, try out the massive water slides, and float around the river ride if they want to laze around like they're on the beach. If your daughter is the type of cosmopolitan girl who loves music, theatre, and culture, why not let her spend her sweet 16 exploring all the cultural sites throughout the city? We can start out by picking all the girls up and checking out some of the museums or exhibits around town. Then the limo bus can take them downtown for some window-shopping at some of the more fashionable boutiques, and then maybe stop by one of the more trendy restaurants around town for a nice lunch. At night, the bus could drive the girls to a downtown theatre, where they can catch one a musical or other theatrical show. No matter what activities or events your daughter plans for her Detroit sweet 16 birthday party, it's important to remember that despite how hectic the planning might be, this day is her day. A girl remembers her sweet sixteen for her entire life. It's best if you can find things to do that everyone will enjoy, but most importantly, your daughter is the star of the evening. Chances are, she'll already have thought all about making sure everyone is happy – after all, it's big sweet sixteen, and she wants everything to be perfect! We know how easy it is to worry over our daughters as they celebrate this transition into a new phase of their lives, so having good, safe, reliable transportation is key to making your daughters sweet 16 experience go smoothly for everyone. Without having to worry about transportation, you can focus on the important part of the night, seeing your darling daughter on her way to becoming a woman. Your daughter only turns sixteen once, so make it a day she'll never forget with Detroit Party Bus.